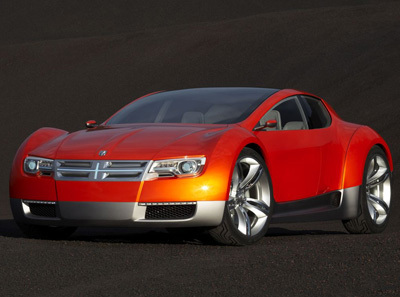 The Dodge ZEO is a 2+2 sports car concept powered by an all-electric drivetrain. The powertrain consists of a 64 kilowatt-hour, lithium-ion battery pack driving a 200 kilowatt (268 horsepower) electric motor turning the rear wheels. This setup gives the Dodge ZEO a 0-60 mph time of just 5.7 seconds, while also allowing for a 250 mile range. The exterior design of the ZEO was Inspired in part by the architecture of a Möbius strip. The rakish A-pillars curve into extended roof rails that twist and converge as they move rearward. The windshield glass continues in an unbroken, curving plane nearly to the rear of the car, giving both front and rear passengers an unimpeded, all-around view while simultaneously showcasing the ZEO's stylish interior. Access to the Dodge ZEO is via scissor doors both front and rear. Inside Dodge have designed the interior to appeal to younger, gadget-aware buyers. "The Dodge ZEO concept is an example of designing for people who are used to a dynamic lifestyle and who are surrounded with information and virtual friends at all times," says Lou Gasevski, principal interior designer of the Dodge ZEO concept.